Giant cups of steaming coffee draw hordes of devotees to Starbucks every day. According to Keelin Pringnitz, some of them pour through the doors for a taste of spirituality. In a recent paper Pringnitz, who is studying toward an MA in Religion and Culture at Laurier, explored the notion of people making sacred spaces in commercial places — coffee shops, shopping malls and yoga studios. No doubt, congregations in many western countries are dwindling. But Pringnitz notes that religion is still a large part of Canadian society. “Religion is not dying — it’s changing,” she says. In her paper, written as part of her major undergrad project, Pringnitz surveyed roughly 50 people about their spiritual experiences at different semi-public places, including two Starbucks outlets near Laurier’s Waterloo campus. So they’re gathering in spaces that haven’t traditionally been considered sacred. And they’re performing rituals, albeit not the traditional kind. Pringnitz considers many of the devotees’ coffee-shop activities — chatting with a familiar barista instead of a pastor, and poring over a text while steeling away from the hubbub of the modern world — to be modern rituals performed on the road to moments of transcendence. Of course, Pringnitz notes, not everyone would say their local coffee shop is a sacred space. 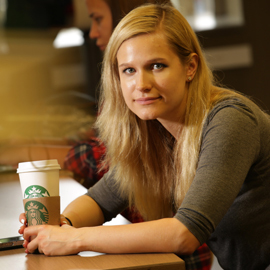 Clutching a caramel macchiato from the Waterloo campus Starbucks, Pringnitz said that sometimes her trip to the coffee shop is just a trip to the coffee shop. But when she’s having a bad day, she said, her ‘time out’ at a coffee shop can conjure a feeling of inner peace. Despite the shift away from traditional religion for many people Pringnitz, who was raised as an atheist and isn’t a member of any religious tradition, said that understanding religion is an important part of living in a multicultural society. Pringnitz’s research fits well into the Department of Religion and Culture’s mission of studying how people explore their spirituality and practise religion today, said Associate Professor Carol Duncan, the department’s chair. About 50 students are enrolled full-time in religious studies programs at the bachelor’s, master’s and PhD levels. But each year the department’s instructors and 9 full-time faculty teach more than 3,800 students, many of them taking electives as part of other Faculty of Arts programs.